Misha Cirkunov of Latvia celebrates his submission victory over Ion Cutelaba of the Republic of Moldova in their light heavyweight bout during the UFC Fight Night event inside the TD Place Arena on June 18, 2016 in Ottawa, Ontario, Canada. 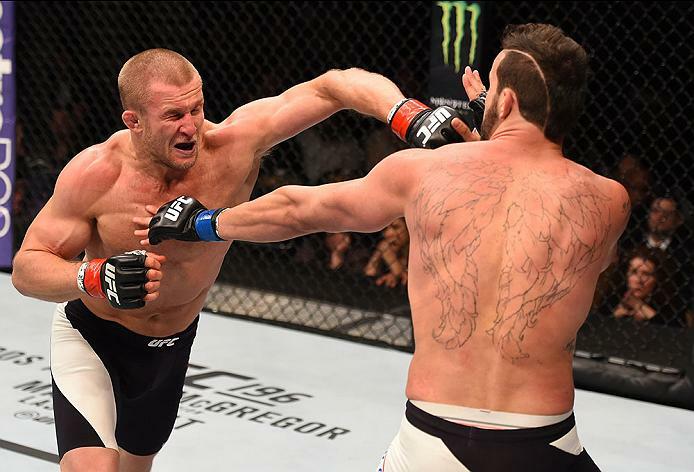 (Photo by Jeff Bottari/Zuffa LLC/Zuffa LLC via Getty Images)" align="center"" />In his first 16 months on the UFC roster, Misha Cirkunov collected four wins, all by way of stoppage, to climb into the Top 10 in the light heavyweight division, culminating with a first-round submission victory over Nikita Krylov at home in Toronto at UFC 206. Heading into 2017, the Latvian-born grappler was a rising star in the division — a fresh face in a weight class constantly searching for fresh faces — but after rocketing into the Top 10 on the strength of his four-fight run of success, consecutive losses showed that Cirkunov wasn’t quite ready for prime time. Now 10 months removed from his loss to perennial contender Glover Teixeira last winter in Winnipeg, Manitoba, the 31-year-old is poised to return, paired off with Patrick Cummins on the main card of this weekend’s debut Fight Night event in Moncton, New Brunswick. While the event takes place in his home country of Canada, Cirkunov will be flying to the Maritimes from the Las Vegas desert, as after several years of running the show himself in Toronto, the light heavyweight hopeful made the move to the fight capital of the world earlier this year in hopes of taking his career to the next level. For a number of years, Cirkunov resisted the idea of joining forces with an established team. He was having success while being a one-man show in Toronto, organizing and executing his own training camps, plus financial considerations made it difficult to simply up and leave the Canadian metropolis. But after seeing all the momentum he’d built during his first four appearances in the Octagon turn to dust with back-to-back losses to Oezdemir and Teixeira, the focused and driven fighter sat down, took stock of his situation and came to the conclusion that a change was in order. “I had a couple losses and I just felt like I was taking on a very serious task and very big job all on my own shoulders,” he says of his previous setup. “I felt like I was running the show in training, calling everybody, and it was too much work in terms of getting everyone to the gym. I felt like after suffering some losses, I wanted to improve my situation with everything — my living situation, my training situation, my training partners. Alex Nicholson in their light heavyweight bout during the UFC Fight Night event at MGM Grand Garden Arena on February 6, 2016 in Las Vegas, Nevada. (Photo by Josh Hedges/Zuffa LLC/Zuffa LLC via Getty Images)" align="center"" />Some fighters need coaches to bring the best out of them — to push them to give their all during training sessions and work to their full potential — but that has never been an issue for Cirkunov. The burly and powerful submission ace has always been a fiercely driven competitor, but he was lacking experience, guidance and high-level training partners. He compares the difference between running his own camp to working with elite coaches to a sports car. Before, everything was about horsepower, but now he’s come to realize that while horsepower is certainly important, so too are the transmission and the type of tires you’re running on. “I needed people with PhDs in what they do,” says Cirkunov. “I train a lot smarter and now I have good scrimmages against people who are doing exactly what I do. I think I went pretty far doing it on my own, but it was time to make a switch. Four months into the switch and encouraged by improvements he’s made since trading Toronto for Las Vegas, Cirkunov is excited to return to action this weekend in the Maritimes and sees Cummins as an ideal opponent to face as he looks to debut “Misha 2.0” on Saturday. “Patrick Cummins is obviously a very tough guy,” he says of his veteran opponent, who has gone 6-4 inside the Octagon since sharing the cage with Daniel Cormier in his short-notice promotional debut all the way back at UFC 170. “He’s no easy fight, whatsoever. He’s fought a world champion in two different weight classes, he’s tough, he’s not easy to put away and he’s a good test.